You'll find the configuration maximums bellow. One year ago, who would have thought of having storage “baked” into a hypervizor where the scalability of capacity and performance is linear. Awesome news. I had a slight problems with my Internet connection last night so I'll be looking for the recording (if being recorded). If you have missed yesterday's online event you can can re-watch the event at the same URL: https://www.vmware.com/now. Definitely awesome. You'll see some good demos too. One of them is to simulate of failure. You'll see what's happen when the host gets down. As you might be thinking – HA will kicks in. Yes sure, but the data was stored on that particular host (there is no physical SAN, the cluster is the SAN) …. Yes, but with 2 additional copies of the data on other hosts, defined by a policy which you choose. Interesting. Need more power? Simple – more servers to the VSAN cluster! Through the assistant simply add another host. The Pricing and licensing shall be announced during GA next week. The VSAN is actually delivered ahead of schedule. The online event is presented by Pat Gelsinger (CEO), Ben Fathi, CTO and John Gilmartin (GM & VP). Here are the facts from the event. 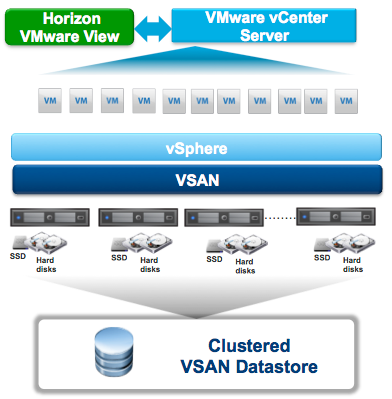 VSAN Nodes will be announced from HP, IBM, Dell, Fujitsu and Cisco – certified for VSAN. Shall be announced with GA next week as well. VSAN nodes are certified servers which can run VSAN without any hardware modifications. You can also adapt your existing hardware which is on the HCL, by checking the HCL for VSAN components (SSDs, HBA, HDDs …) and add those components into your servers. All this is certainly very exciting, as there is only one more week to wait until GA. 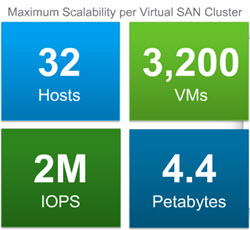 Check the vSphere 5.5 page where VSAN has the TOP place. Certainly exciting times ahead. Another good news I would like to share is that @CormacJHogan and @DuncanYB are preparing a new book on VSAN called Essential Virtual SAN – Rough Cuts. The book shall be out for VMworld 2014. Stay Tuned! Great post about vSAN – we want the SSD as close to the CPU as possible – when will vSAN add write caching ala Pernixdata? How will vSAN be licensed? (bundled Ent or separate)? All writes goes to solid-state disk or PCIe Flash device first. However Magnetic disks (MD) are the ones that offer capacity for storage. The SSDs are used as write buffer before the MD, and also for read cache. To be confirmed next week, but I’ve heard VSAN will follow per CPU licensing model.